Puppies require LOTS of care and attention. Remember the five 'P's:' Prior planning prevents poor performance. 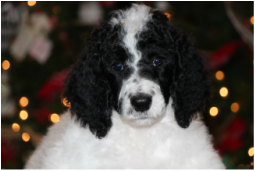 On this page you will find many helpful links to learn about puppies and poodles in general. If you've never trained a puppy (or if it's been a while), please check out Leerburg training DVDs. Leerburg also has many free e-books available on puppy training. Many wonderful resources are also available at the Edmond Public Library. The Oklahoma City Metro Library system also has puppy training books available for free download to a kindle or other e-reader, as well as many DVDs and audio books. Appropriate	dog grooming tools. Start grooming early on to get your puppy used to it. Identification Tags. Baby gates for unsafe areas of your home. Read about the Standard Poodle. _Before you jump into pet ownership, please take a moment to read about the costs of owning a dog. Remove or hide all electrical cords - Puppies have razor sharp teeth and will chew anything it can. Barricade staircases and balconies until your puppy has been taught about the dangers. Safely store all cleaning detergents, fertilizers and insecticides. Just a little bit can cause fatal poisoning. Medicines and prescription drugs often taste really good, ensure that your dog does not have access. Curious puppies particularly like anti-freeze, so keep all motor oil and such out of harms way. Repair existing or install garden fencing. It is essential that your doggie must not be allowed to roam, unsupervised, outside your property. Cover all water features and pools, many dogs young and old are accidentally drowned. Don't let this happen to your precious pooch. Many plants are poisonous to dogs. Ask your local nursery if you are not sure.